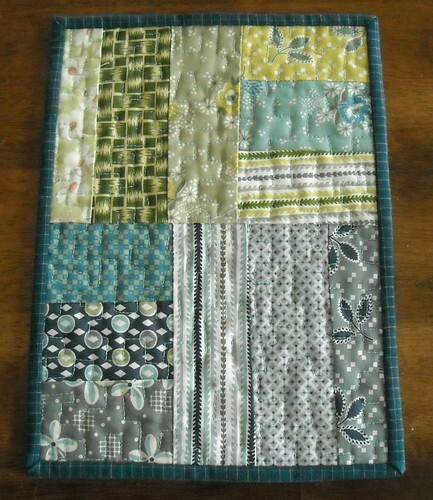 Back in July, I made a couple quilting bee blocks for Natalie of beyond the reef patterns. She requested that we use the scraps to make a quilt for the Alzheimer's Art Quilt Initiative. I made the quilt top but didn't finish it right away. Fast forward to 2011--a few days ago I got an email from Rene' at Rene' Creates, asking for help in getting the word out about the Alzheimer's Art Quilt Initiative. Rene' has come up with a challenge and will be hosting monthly drawings for those who make and submit quilts to AAQI. So the other day I was feeling the need to finish one of my many UFOs... and here it is! I just got it registered on the AAQI blog and am awaiting shipping instructions. It didn't take too long to finish and the binding fabric is kind of special. It's from one of my husband's grandpa's shirts, that I used to make the shirt quilt for his grandma. I couldn't find any other fabric that matched, and I'm glad I remembered one of the shirts was a dark blueish green fabric. If you're interested in making (or buying) a quilt to benefit Alzheimer's research, visit the AAQI website. The quilts must be 9x12 inches or smaller, so it can be a quick project if you want (and if you're not a procrastinator). 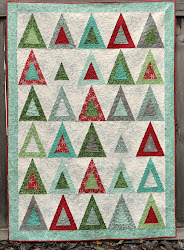 I tried out a new free motion quilting design on this quilt, and I think these quilts would be a great use for scraps, too. The most difficult thing for me is that you must give the quilt a name--I'm not good at naming my quilts. I'm going to make another one--this time I'll plan on having it done by the end of February. What do you think? Will you make one too? Nice touch on the binding, yes I think naming it after your Grandpa is a good idea. It's beautiful! I'm trying to think of some name involving the shirt (love the shirt quilt!) and some aspect of Alzheimer's. Shirt Tales, Shirting ... I don't know ... but thanks for giving me something fun to mull over on the drive to work! This is lovely and such a wonderful thing to do and a fabulous cause to support. My own mother has advanced Alzheimer's and I am an ardent supporter of AAQI and all of the work they do. I also make and donate quilts and love doing so! Thank you for making this and I look forward to coming back and reading here, again! I love it, Vicki! Think I'll do one, too. What did you decide to name it?